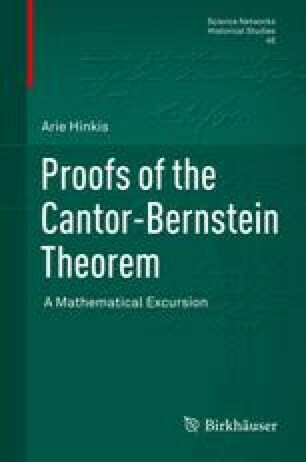 In 1955 Marian Reichbach published a one-page paper titled “A simple demonstration of the Cantor-Bernstein Theorem” which we review now. The proof contains very little that is new and one wonders why it was published at all. The journal in which it was published, Colloquium Mathematica, does publish “interesting new proofs of important theorems” but this criterion can hardly fit Reichbach’s proof. Still, since the paper contains a direct proof of CBT we have included it in our excursion and it concludes our stay at the Polish school.